You will be given a reference e-book to read which has 590 pages And the test will be based on that e-book , you can take final test within 1 year of purchase. Web page design can be defined as a process which involves the creation of a web page and designing it to improve its appearance by choosing the perfect color schemes, fonts, page layout and any other element that can make it even more attractive. Each page in a website comes with different contents but all these pages have the same graphic design. It should also be noted that web page design covers different disciplines and skills used in producing and maintaining websites. It encompasses interface design, web graphic design, authoring which includes proprietary software and standardized code, search engine optimization and user experience design. If you want to become a professional web designer, then it is advisable for you to increase your awareness about usability and be updated with the guidelines linked to web accessibility. It should also be noted that web page design may include the use of website templates that contain major elements of web design including backgrounds, buttons, CSS style, borders and different web graphic elements including bullets, header banners and hover images. You may also consider using your own design elements. This is a good choice especially if you want to create web pages with unique contents and comes with styles that are not completely applicable to all pages. If you dream of becoming a certified web designer, then you should be willing to improve your skills when it comes to creating a more customized layout and elements for web design that are capable of handling various images, layouts, styles, buttons, fields and drop down menus. If you want to mold your skills and expertise in the field of web page designing, then you have to know that enrolling in the web page design certification program offered by Brainmeasures can offer you numerous benefits. One benefit of enrolling in the web page design course from Brainmeasures is that you get the chance to access the most comprehensive and the most reliable online certification course possible. With the help of this certification course, you will be able to receive a fully detailed web page design training which is guaranteed to work when it comes to strengthening your background about the specific steps and procedures that you can use in designing web pages. This web page design certification course also makes it possible for you to understand the various elements that make a web page even more attractive, the techniques that you can use when it comes to creating the best layout for your web pages and the different disciplines and areas covered by web page designing. 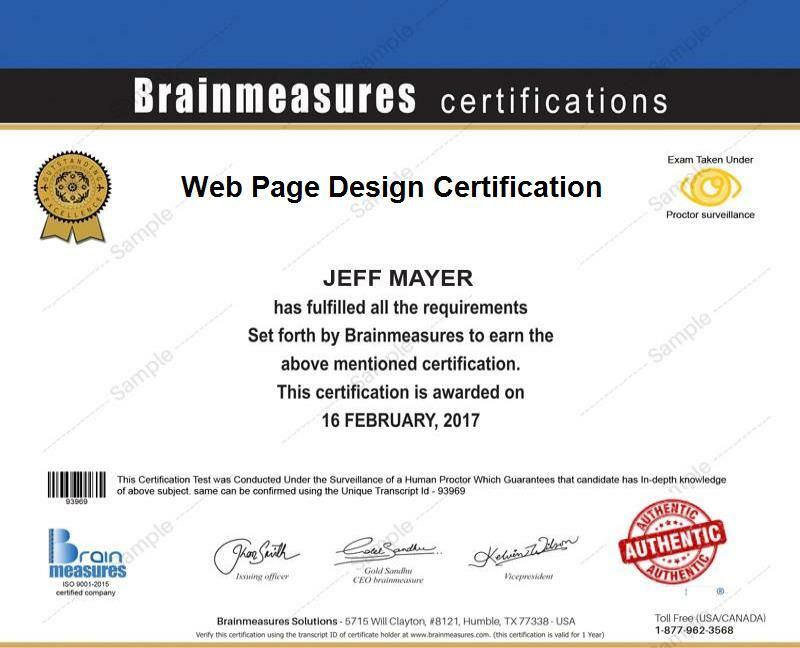 Receiving your web page design certificate from Brainmeasures is proven to be really rewarding since it allows you to show the industry that you are highly proficient and knowledgeable in this specific field. How to effectively connect your website to the social web? How to design a website to make it more suitable for mobile visitors? The web page design certification course which is now offered by Brainmeasures to the public is guaranteed to work in understanding all the vital aspects of web page designing. This certification course is most suitable for web project managers, web content developers, graphics and marketing staff, technical support personnel and any other individuals and professionals who wish to improve their knowledge about designing interactive websites and creating rich media advertisements, games, engaging presentations, instructional media and any other element that can make each page of a website even more appealing and interesting. Your web page design certification is also your ticket towards receiving an even higher salary. Your web page design certification is extremely useful in your attempt to work as a web page design specialist which increases your chances of earning at least $47,000 every year. You can also work as a web graphic designer which allows you to earn around $45,000 to $80,000 annually. If you work as a web design consultant, then earning an average annual salary of $91,000 is greatly possible.